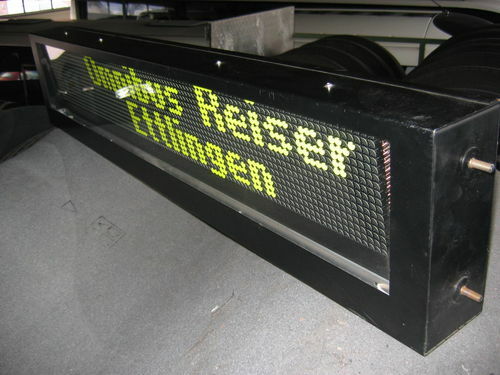 Admit it, you’ve always wanted to have your own flip-dot display to play with. Along with split-flap displays, flip-dots have an addictive look and sound that hearkens back half a century but still feels like modern technology. They use a magnetic coil to actuate each pixel — physical discs painted contrasting colors on either side. It means that you really only need electricity when changing the pixel, and that each pixel makes a satisfyingly unobtrusive click when flipped. The only problem with the displays is that they’re notoriously difficult to get your hands on. Breakfast, a Brooklyn-based hardware firm known for creative marketing installations, unveiled their Flip-Disc Display System this morning. Used displays have come up on the usual sites from time to time, but often without a controller. Traditional flip-dot manufacturers haven’t sought out the individual hacker or hackerspace, and a click-to-buy option has been difficult if not impossible to find. Breakfast’s offering modernizes the driver used to manage all of those electro-mechanical pixels. Whether this will make the displays more accessible is a question that still needs to be answered. While casually lurking on a famous auction website, [TeddyDesTodes] found the gem shown in the above picture and reverse engineered it. This is a flip dot display, the Brose Vollmatrix compact to be precise. It consists of a grid of small metal discs that are black on one side and yellow on the other, set into a black background. With power applied, the disc flips to show the other side. The disc is attached to an axle which also carries a small permanent magnet. Positioned close to the magnet is a solenoid. By pulsing the solenoid coil with the appropriate electrical polarity, the magnet will align itself with the magnetic field, also turning the disc. After carrying the 25kg display from his post office to home, [TeddyDesTodes] opened it and discovered that the main control board was using two RS422 transceivers. So he fired up his bus pirate, started to sniff the traffic and noticed that several commands were repeatedly sent. [TeddyDesTodes] stopped the transmission, sent these particular commands and had the good surprise to see some dots flipped. From there, displaying something was a piece of cake. If this is familiar to you it may be because it was shared in one of the Trinket Contest Updates. But the background details were just so much fun we think this deserves a full feature of it’s own. Do you agree?